In the years prior to this particular theme, Haunted Shack mainly housed alien and toxic waste ideas. “The Curse of the Werewolf” was a well thought-out, well decorated maze. Outside, the sets were designed to look like forests, while inside the mood changed into a renaissance type theme (complete with harpsichord music heard). One of the highlights of the maze was passing by a huge, mechanical werewolf, while other werewolves were “stalking” their prey. 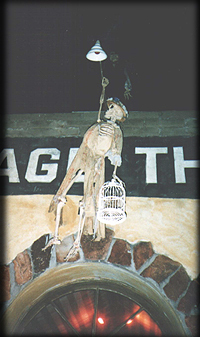 1995 was the last year that Knott’s used this space for Halloween Haunt. “WINDJAMMER” was about to be built, and one of the best sites for mazes was lost. “Industrial Evil” was the beginning of what was to become “The Underground”. Back then, more room was available for the maze to build bigger sets. “Industrial Evil” was basically the same maze as “The Underground”, only longer. The music was the same and the sets were primarily moved to a new location in Fiesta Village.